Further south, in Khan Younis, an extended family was wiped out in an air strike on a house. The number of dead was put at between 24 and 28. 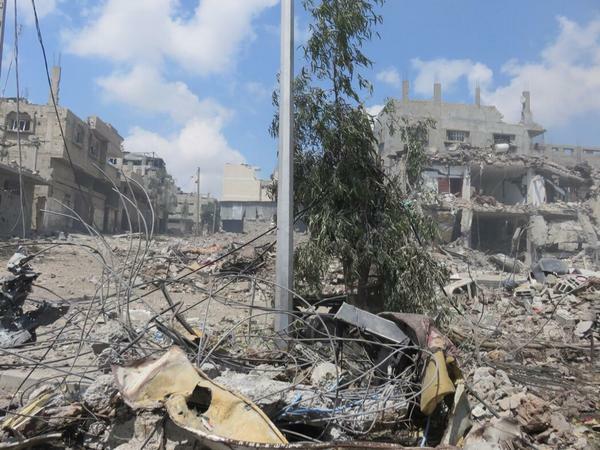 The Palestinian Centre for Human Rights said another 10 people were killed in a single air strike in Rafah, including four young children and a baby. Special dispatch: Peter Beaumont reports from Shujai'iya where fleeing and injured tell of streets strewn with bodies and rubble. Al-Beltaji Street, off the main road in Shujai'iya, is a scene of utter devastation – the site of Israel's bloodiest assault in almost two weeks of fighting in the coastal strip. A body was carried out of a ruined house, then a second and a third – seven in total from buildings within a hundred metres of each other during a brief agreed lull in the fighting to evacuate the dead and wounded. A little further along, bodies lay in the street where they had fallen, mostly scorched figures – one still in a yellow dressing gown – others missing limbs. At least 67 people – some fighters but many civilians – were killed in a night of intense violence in Shujai'iya that has been described by the Palestinian president, Mahmoud Abbas, as a massacre. Hundreds more were injured. Both sides have accused the other of breaking the ceasefire. An Israeli military spokesman conceded that during the brief initial pause in fire, Israeli forces had continued firing in an adjacent neighbourhood – an area, he claimed, that was not covered by the truce. Nonetheless, it is that Israeli fire that appeared to have hastened the Hamas fighters' return to hostilities. As the regular thud of explosions resumed, three Palestinian fighters – carrying AK-47s, and with their faces wrapped in scarves – jogged along the street. Other militants were seen sheltering in the buildings. Shujai'iya residents said the heavy shelling began around midnight as tanks and soldiers reached the edge of their neighbourhood – a fierce gun battle followed. In the first hours of shelling, it was too dangerous for ambulances to approach – residents were faced with a choice: stay and risk being killed while sheltering at home, or make a run for it and risk being caught in the crossfire. Those who decided to flee started moving at dawn, when Shujai'iya was still under heavy Israeli tank and mortar fire. They hurried past the corpses in the street, some carried their frightened children, most with only the clothes they had escaped in – several barefoot. 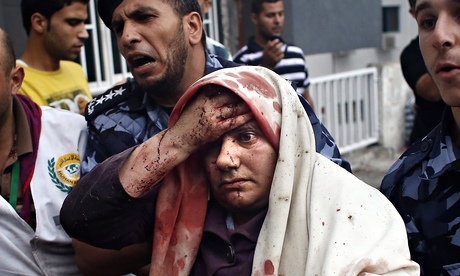 Many of those who fled Shujai'iya headed for Gaza City's Shifa hospital, which was engulfed in chaos. Ambulances that had finally and briefly been given access to the site of the carnage sped in steadily, ferrying the dead – among them a local TV cameraman, Khaled Hamad, who was killed during the overnight offensive alongside a paramedic. At the morgue, dozens crowded the entrance demanding to be let in to look for missing relatives – and too often found them. "When the shells started we couldn't leave the house – 30 of us. The shells were hitting the upper floor so we all moved downstairs. Then the shrapnel started hitting our door. "It became quiet for a moment and we decided we should run. But as we were on the road a shell landed near me, breaking my leg. I told my family to go on with out me. I carried on – stopping, then limping. Two hours later, an ambulance reached me ."